Our Niji Sushi Department is truly a hidden gem – incredible variety, fresh as can be, and a great value! 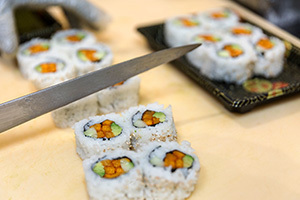 Every roll is freshly crafted each day in-store by our talented Sushi Chefs. Tuna, salmon, crab, and shrimp are just a few varieties available in our sushi case. Not a fan of seafood? Our Sushi Department offers various vegetable options including cucumber, avocado, sweet potato, and carrot drizzled in sweet and spicy sauces. Don’t miss our signature crab rangoons made from scratch in our stores, which can be found on the Market’s Kitchen hot plate. Our Sushi Chefs are more than happy to assist you with a custom order. We offer specialty rolls and platters for any occasion. 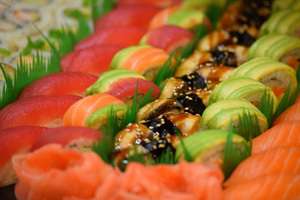 Impress your guests with an eye-catching sushi platter, guaranteed to be the talk of the party!